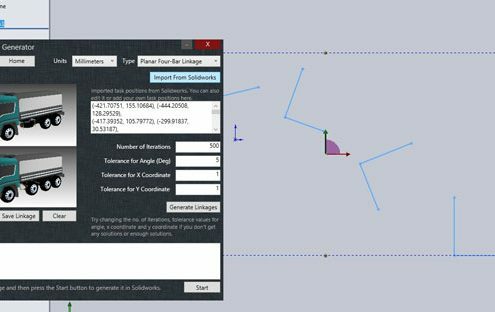 This trial version of Mechanism Generator provides a five-position synthesis feature that generates planar four-bar design candidates. The five task positions of the coupler link are specified in a SolidWorks sketch that is in your existing model. MechGen 2.0 reads the sketch and designs a set of four-bar linkages that achieve your goal. A previewer allows you to see the operation of the various linkages. 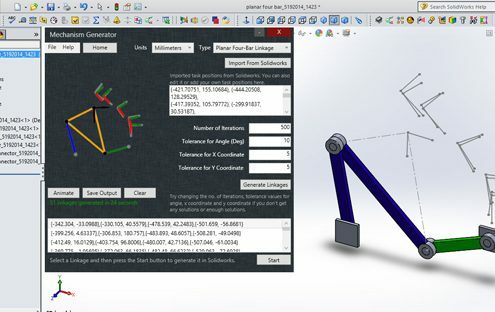 Select the linkage you like and have MechGen create a SolidWorks assembly that you can import directly into your model. This version includes Browser Mode that allows solutions from the Generator mode to be saved for later use. The full version is $695.00 | Contact us for educational pricing. We can make adjustments for Mathematica 8.0+, Solidworks 2013 and Solidworks 2013/2014 Academic, but we need to be notified in advance. 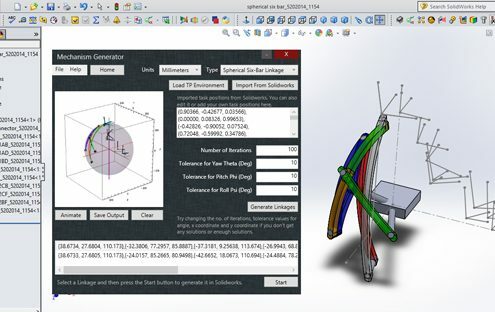 MechGen is a SolidWorks Add-in that helps you draw and design four-bar and six-bar linkages. 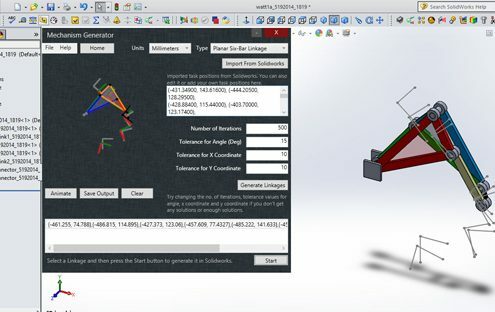 MechGen 1.0 draws the 3D model of the linkage you specify. 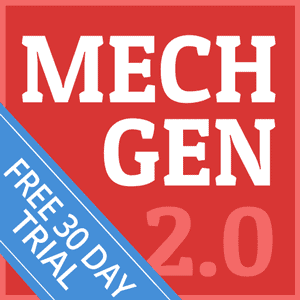 MechGen 2.0 takes five task positions in SolidWorks and presents a variety of four-bar linkages the provide this movement. Then it generates the solid model of the linkage you select. 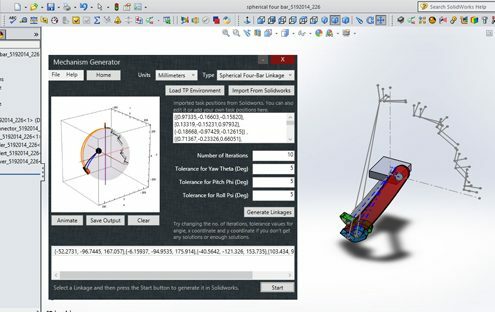 MechGen 3.0 begins with a 3R chain and five task positions in SolidWorks and presents a variety of six-bar linkages to provide this movement. It then generates the solid model of the linkage you select.